MS is hosting a live chat on March 31st regarding Windows Embedded CE and Windows Mobile. "xxxxxxxxx PID:xxxx TID:yyyy yyyy: RELFSD: Opening file example.dll from desktop"
A possible cause is the deactivated Platform Builder option "Enable Access to Desktop Files". Ensure that this option is active, if you're using flat release directory. But this behaviour is also the classic symptom of the too small MTU size (MTU = maximum transmission unit) on your desktop. If the MTU size is set to a smaller value than Platform Builder can handle (= 1500), the result is that the packets sent across the kitl transport link for relfsd are fragmented, and the transport service can't handle that. The MTU size value is often reduced when you install some kind of VPN software on your desktop. The MTU size value is set in the registry (under HKEY_LOCAL_MACHINE\System\CurrentControlSet\Services\Tcpip\Parameters) on your desktop. Search for all keys with name "MTU"and change all values from to 1500(decimal). If you won't find the "MTU" key, the desktop assumes the default MTU value (= 1500). Don’t miss the upcoming free Windows Embedded OEM Technical Seminars and Workshops held in Ljubljana, Slovenia tomorrow, March 31st 2009. It is intended for technical decision makers and developers. MS will show you the latest innovations in embedded software development and present the Microsoft Embedded Products as well as their development tools and give you the opportunity to asked questions about them. Porting Kit Promotion Period Ending! After April 15th you will not be able to download the .NET MicroFramework V3.0 Porting Kit for the low price of $599.95, instead the price will go back up to $2500! So if you have been thinking of buying the porting kit but have been putting it off you might want to download it now. You can find the latest information about the porting kit here: http://www.microsoft.com/netmf/about/switch.mspx. You get the error "ToolsMsmCA(Error): IHxFilters filter registration failure..."? The installation only fails when the 'Internet Explorer Enhanced Security Configuration' is installed. After uninstalling this package, the SDK installed fine. Getting ready to take your Microsoft Certification for Windows Embedded Standard 2009? Then you will be glad to hear that the first 3 chapters of the exam preparation kit for the Windows Embedded certification are now available. The Prep Kit is currently only available in english, but additional languages are in the queue and will be available soon. Download the Prep Kit here. If you're in the catering business and visiting the GAST Exhibition in Salzburg this week, you will see the AMI drink dispenser, from AUG Elektronik running "under water". The demo, which you can also watch on YouTube, demonstrates that the dispenser can still be run while liquid is running over the top of it. The AMI drink dispenser is using ATMELs QMatrix technology. ATMEL will also be displaying the AMI DevKit with the QMatrix glass front at the ESC Silicon Valley 2009. When a blog posting is one or two years old nobody can remember it. Maybe Google may find it for you. One of this postings is Michel Verhagen's QFE Installer from November 2007. The installation of QFE's is not a nice task, it's lengthy and you have to stay close to your computer because there are a lot of screens you have click through before it actually installs. There is unfortunately no way to install all QFE's without a user controlling the mouse... until now! And here is our first video on this blog. Sorry about the quality, I had to nick my daughters "pink" digi cam. Andreas had already "u-tubed" his Tetris Demo running on the AMI Dev Kit and in the past I had written about SPOT Watches ... and do you remember back in the old days when we used to run around with Casio watches playing Pac-Man? 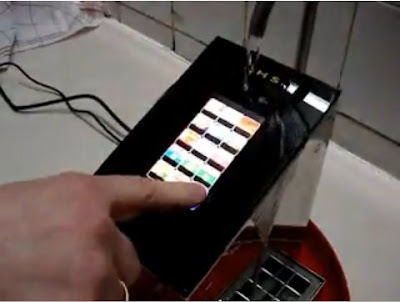 Well then have a look at this video with Tetris running on a SPOT Watch. Whether you would like to watch Dion Hutchings, Technical Product Manager, explain what Windows Embedded CE is, have a better understanding of KITL or find out what the differences of Windows Embedded Operating Systems are - the Windows Embedded Video Channel offers a growing variety of clips from technical "how to"s, events to customer case studies. If you take a closer look at the Microsoft Booth, you will see the POS-Terminal that wasn't there this year. Here is a picture of what the booth looked like this year. Hope you like the Embedded Care Packet, Michael. Just, send us your address (embedded-experience at gmx dot de) and we will send it off. EB will be participating with a partner pod on the Windows Embedded Booth during the Hannover Messe, from April 20th - 24th, 2009. The Hannover Messe, established sixty years ago, is the leading showplace for industrial technology and products. You will find the Windows Embedded Stand in Hall 9, Booth 17. EB will be showcasing it's expertise in the Industrial Automation Area and Windows Embedded Products and will also be presenting in the presentation theatre. Stick around for more news around this event and to find out which other partners will be there. In the wake of the embedded world and CeBIT Microsoft announced details of the next version of Microsoft Auto last week. According to Microsoft, the new automotive infotainment software platform, will support x86 processors like Intel's Atom Z5xx in addition to ARM and SH processors. This "most comprehensive release ever" will also offer a standard interface for broadcast radio tuners as well as CD playback and ripping support and is to be available during this spring. But, this was not the only announcement made last week: An open source alliance, codename GENIVI, was also announced with the aim to build an open source In-Vehicle Infotainment (IVI) reference platform and planning to have its first fully tested reference model available this summer. This platform will also support Intel's Atom Z5xx and will be running Wind River Linux. For Microsoft we have Fiat's Blue & Me running in Alfa Romeo, Lancia and Fiat brands as well as Ford's Sync and Ford Work Solutions already on the road and OEM's such as Hyundai and Kia who have also announced plans to offer Microsoft technology. And the soft- and hardware partners are EB, Continental, Magnetti Marelli, Nuance, MPC Data, K2L and more. GENIVI has just been founded so there is nothing on the road at the moment, but with big OEM's like the BMW Group, General Motors and PSA Peugeot Citroën this is surely only going to be a matter of time. Other members of the alliance are Visteon, Wind River, Delphi, Intel and Magneti Marelli. So the bets are on! Who do you think will win the race? As for me, I will do the same as I did some years ago and put my money on Microsoft. the latest Windows CE updates have been recently released and are available for download. Some critical issues (especially the fix in kernel at Windows CE 6.0) have been resolved so get them now! More information for each update is provided in the Readme document available after the individual update(s) has been installed. Download this set of updates for Windows CE 5.0 Platform Builder released during the period of February 1 - February 28, 2009. These updates are fixes for Windows CE operating system problems you run into during the development and maintenance of your custom platform. 090216_KB967347 - There is a race between the async notification thread timing out and exiting, and a new async notification getting queued. Under certain circumstances the new async notification may get ignored. 090212_KB967335 - Memory size returned by SD bus driver is less than actual size. 090224_KB963672 - This update addresses the issue with Schannel authentication. 090216_KB967751 - In cache, if index.dat is corrupt or there are no cached files in a cache folder, the old cache folder may not be deleted. 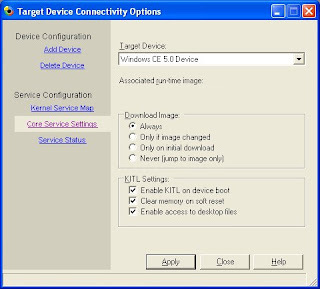 Download this set of updates for Windows Embedded CE 6.0 released during the period of February 1 - February 28, 2009. These updates are fixes for Windows Embedded CE operating system problems you run into during the development and maintenance of your custom platform. 090226_KB967334 - This update addresses the issue with the memory being freed up multiple times after a warm boot. 090226_KB960707 - This change would allow a display driver to override the built-in table with one of its own. 090216_KB967106 - This update addresses some issues with MSFlash driver. 090226_KB968092 - This update addresses an issue with incorrect handling of XML tags. 090209_KB963076 - When running makeimg tool on Windows Vista, cenlscmp.exe may stop working. 090212_KB961933 - Calling LoadLibrary for an executable may result in successful return code even though load fails. 090211_KB963681 - Serial Redirection in RDP session may not work properly. 090224_KB963674 - This update addresses the issue with Schannel authentication. 090212_KB961074 - Internet Explorer may not recognize certain registered file extensions even after the plug-ins have been installed. EB - Windows Embedded Gold and Training Partner - is offering a Windows Embedded CE 6.0 R2 Training course from March 24th - March 25th at Erlangen / Germany. To register simply go to the EB registration site here and if you refer to this blog you will also be entitled to a free copy of a Windows CE 6 book, which you can pick up after the training. For those of you who didn't manage to visit the embedded world this year, here are a few visual impressions missing from my last post. Oh, but wait a minute. Something's wrong! If you can spot something that just can't be right let us know. The first person to spot the mistake will receive a small Windows Embedded care packet. As you know the embedded world took place in Nuremberg last week, and for those of you who were there you will of noticed a few things. First - I have to say this as all the negative headlines and pessimism around the global finance crisis is really annoying - it was amazing how many people were there. The display area grew by over 5% and the halls were full and bustling during the three days. So if anybody is wondering why CeBit was doing so hard this year, you don't have to look far. I reckon CeBit lost to the smaller but more technical focused Embedded World. The Microsoft Auto Business Unit was at the Embedded World for the first time with some of thier Partners showing variuos solutions for the Microsoft Auto Platform (Remember, I blogged about this) and during the three days they also talked about the future of Microsoft Auto in the forums - Gregs Presentation about the Road Ahead was worth listening to and also an extra blog, so stay tuned. The Windows Embedded Team and their Partners (12 in all) had lots to do - I have never seen the booth so busy - and even I got caught in discussions - must have been the Windows Embedded Gold Partner shirt ;-). If you asked the right questions, there was some information you could get out of the Microsoft guys concerning Windows Embedded Compact (the next version of Windows Embedded CE) aka CE 7 aka Chelan. I think an interesting bit of information is around the time schedule, as this has been moved to the first quarter of next year - hopefully to add additional features. If you were looking for .NET MicroFramework you might have got the impression that the hype has died down a bit - but not so - you just had to look a bit more carefully. 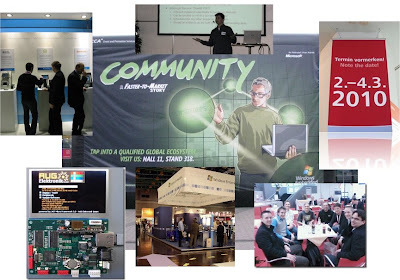 Pavel blogged about a small community get-together during the Embedded World. March 2nd - 4th, 2010 in Nuremberg! Oh, yes before I forget: Manoj, remember I'll be taking you out to Mount Lavinia next year - and Olivier you had better come as well ;-). EB is one of the first companies authorized to offer training courses for the Microsoft Auto software platform. "EB qualified itself as a training partner for Microsoft Auto as a software and operating system expert in the automotive sector and on the basis of its long experience as Windows Embedded Gold Partner and a provider of customized training courses." The guys from EB have already been doing Trainings for OEMs and Tier1s as well as lots of work around the Microsoft Auto 3.0 platform and it's predecessor in projects such as Fiat's Blue&Me or Ford's SYNC platform. The Trainings will be a mixture of a technical deep-dive into the Windows Embedded operating system and the specialities of the Microsoft Auto platform as well as contain hands-on practical sessions, using the Microsoft Auto 3.0 Development Kit. Other Microsoft Auto Training Partners are: MPC Data and BSquare. Of course we will also be around for other discussions and questions. I am really looking forward to seeing you all and having some very interesting discussions!